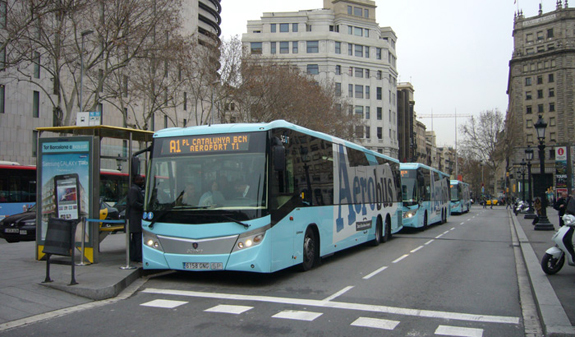 Aerobús is the bus service that connects Barcelona Airport and the city centre and vice versa. Buses run every 5 minutes, all year round, and the journey time is approximately 35 minutes. 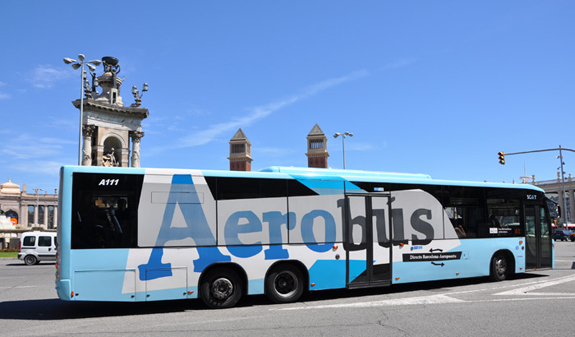 With stops at some of the most convenient locations in the city, the Aerobús is the fastest, most practical and comfortable way to get to and from the airport. 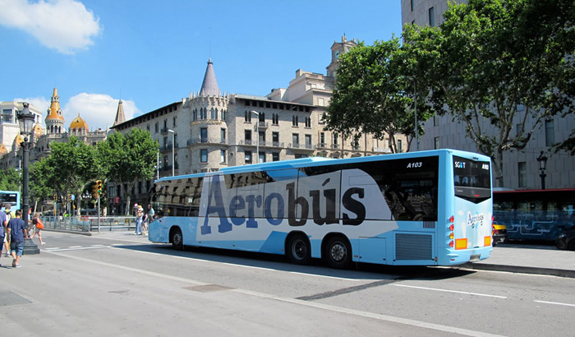 The Aerobús runs from 5am until 1am and connects Barcelona with the airport from several centrally located points. 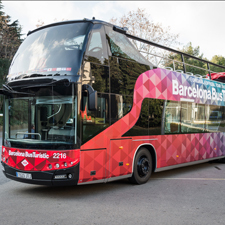 You can board the bus for the airport at the main stop in Plaça Catalunya where buses depart every 5 to 10 minutes for terminal T1, or every 10 to 20 minutes for terminals T2B and T2C. You can also catch the bus at different strategically located stops such as Plaça Espanya or Gran Via on the corner of Carrer Urgell. 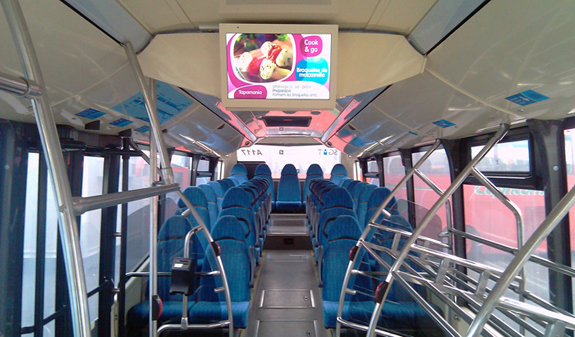 During the journey, passengers can enjoy our TV channel with information about things to do in the city. Inside the bus there are spacious luggage racks and passengers can also travel with pets, provided that they are in carriers of the right dimensions to ensure they don't inconvenience other passengers. Visually and hearing-impaired passengers can travel with guide dogs. All the buses are adapted for reduced-mobility passengers who can travel in their wheelchairs in the reserved seating area, or in a standard seat with their wheelchair stowed in the luggage rack. Single or round trip ticket. Valid for one passenger and his/her luggage. Route A1: from pl. Catalunya (Barcelona) to terminal T1 (airport) from 5am to 6.40am and 9.50pm to 00.30am, every 10 minutes. 6.50am to 9.45am every 5 minutes.from terminal T1 (airport) to pl. Catalunya (Barcelona) from 5.35am to 7.20am and 10.25pm to 1.05am, every 10 minutes. 7.30am to 10.20pm, every 5 minutes. Route A2: from plaça Catalunya (Barcelona) to terminal T2 (airport) from 5am to 6.50am and 10.40pm to 00.30am, every 20 minutes. 7.05am to 9.45pm, every 10 minutes. From terminal T2 (airport) to pl. Catalunya (Barcelona) from 6am to 6.40am and 11.10pm to 1am, every 20 minutes. 7am to 11pm, every 10 minutes. From Barcelona to Barcelona-el Prat airport: pl. Catalunya. 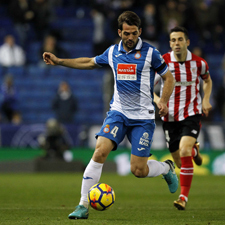 Metro L1, L3: pl. Catalunya stop. Bus: 14 and 59. 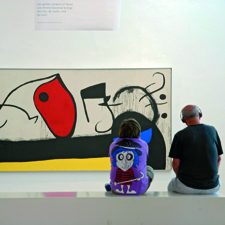 | c/ Sepúlveda, 125. Metro L1: Urgell stop. Bus: H12, H16, 24, 41, 50, 55, 64 and 91. | pl. Espanya. Metro L1, L3: pl. Espanya stop. Bus: 13, 23 and 150. | Barcelona-el Prat airport T1 and T2B. From Barcelona-el Prat airport to Barcelona: Barcelona-el Prat Airport, terminals T1 and T2B. | pl. Espanya. Metro L1, L3: pl. Espanya stop. Bus: 13, 23 and 150. | pl. Universitat. Metro L1, L2: Universitat stop. Bus: H12, 14, 50, 54, 58, 59 and 66. | Pl. Catalunya. Metro L1: Pl. Catalunya stop. Bus: 14 and 59. The return ticket can be used within 15 days from the single ticket. You can validate your voucher with the QR code at the entrance to the bus. Wheelchair users seated in the reserved area must wear a seatbelt. The average journey time is 35 minutes, but may vary depending on traffic, weather conditions or any causes beyond the operator's control. Route A1 goes to terminal 1. Route A2 serves terminals 2B and 2C.